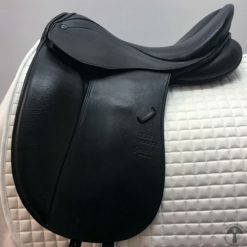 This is a Black Country “Working Hunter” model 17.5 W jumping saddle, featuring Black Country’s “schrumpf” leather which gives a soft, grippy feel to the seat and pads. 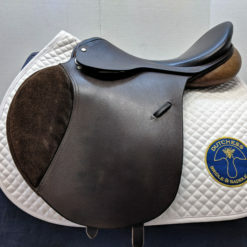 This saddle has never been used! 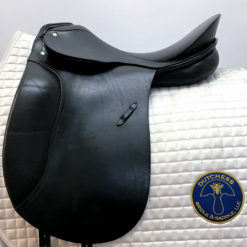 The Working Hunter is an English style of saddle that works well as a general purpose saddle and for Working Hunter classes. 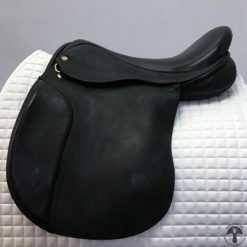 This style of saddle is also popular for cobs and other native English breeds. 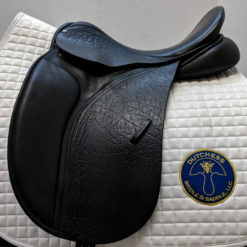 We’re proud to include Black Country in our Trusted Brands! 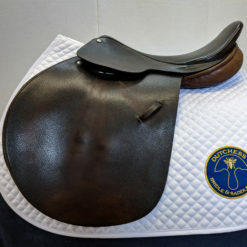 Click here to see why we love Black Country. 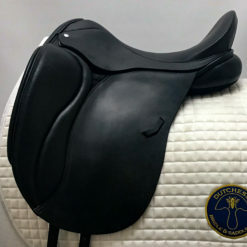 HORSE FIT DESCRIPTION: This saddle would fit a wide, A-shaped wither with little wither definition and a somewhat level back. 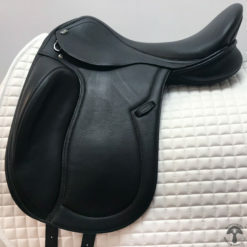 RIDER DESCRIPTION: The combination of a flatter, open seat with a slightly forward flap and a small thigh block makes this saddle more of a classic close contact jumping saddle.